The Day is observed to advance human welfare, freedom and progress everywhere, as well as to encourage tolerance , respect, dialogue and cooperation among different cultures, civilizations and people. Since its inception, the UAE has managed to be a magnet for millions of people from all over the world thanks to the values that it adopts which are based on coexistence and brotherhood, human tolerance and cultural convergence", Shaikh Nahyan said. The ministry of tolerance will continue to promote the principles of tolerance established by the late Sheikh Zayed bin Sultan Al Nahyan. The TRAb level was lower in three doses in the tolerance groups than in the respective controls or model group. As in life, the issues that place tolerance in the crosshairs of controversy are often so simple, but anything but easy, to fully comprehend. Opinions about the tolerance of people of different religions were similarly split by region. Because studies of SR must be conducted with individuals of legal drinking age, 21 years or older, participants typically already have considerable drinking experience, making it difficult to determine if differences in SR are due to innate individual differences or differences in the acquisition of tolerance. All mushroom growers should be alerted that changes are forthcoming for two widely used crop protection products, as the tolerances for thiophanate methyl and diazinon are scheduled to expire. 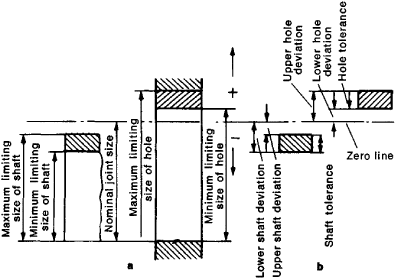 At the manufacturing stage tolerances are simply allocated to working dimensions depending upon the process capability of the manufacturing process, stock-removal for each successive operation and the design tolerance level of the nominal dimension. Critical thermal methodology, CTM, (Cox 1974) was used to estimate lower (CTMinima) and upper n(CTMaxima) temperature tolerance of green sunfish acclimated to 10, 20, 30, and 35[degrees]C.
The ST Axis, available in four sizes--500, 400, 340, and 300--has a straightness tolerance of +/- . Economical production of an accurate popularity counter for coin-operated automatic record players is made possible by an aluminum die casting which maintains concentricity tolerances 50% closer than ADCI standards.